These are the most often used and the simplest gear system with cylindrical gears with straight teeth parallel to the axis. They are used for transmitting rotary motion between parallel shafts. When a smaller gear called the pinion, drives the larger gear called the wheel, also having external teeth, the corresponding driving and driven shafts rotate in opposite direction. The two gear surfaces come into contact once and so they are noisy at high speed. External gears are generated with a tool moving forward towards the component axis. 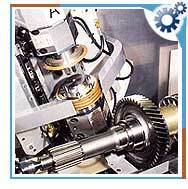 Internal gear cutter with very small diameter and few teeth is used for the production of external gear. External gears are widely used in various industrial sectors like coal industry, mining, steel plant, paper industry, and many more.